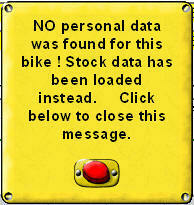 Only for bikes that are already present in the preset database and you previously saved Personal data, you can load this personal data instead of loading stock data in all fields. This only works when your Internet browser has cookies enabled and saves them until the expire. This way you can load your bike with all your changes already entered in the fields without having to change them manually every time you use the Gearing Commander. 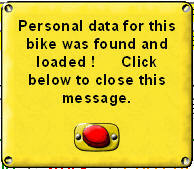 Click the red button to close the message and use the Gearing Commander as usual. Instead stock data has been loaded. Now check your browsers cookie settings and make sure they aren't blocked and kept on your computer after closing the browser ! Remark: Personal data saved in the Online version cannot be Loaded in the Stand Alone version and the other way around. This means that for each version you once have to save your Personal data.